Finding the right solution provider that best fits your product needs is something that must reach well beyond the latest gadget or technology offered on the market. Today, decision makers must venture beyond those that simply sell a particular product or service, serving as true solution providers that work hand-in-hand with our loss prevention teams to tackle the latest industry challenges. But what does it take to be a true solution provider? How do these partners go about building their teams, approaching their business partners, and establishing the foundation for real and lasting solutions—and relationships—with their loss prevention partners? For perspective and input we turned to executive leadership from three leading companies to discuss some common themes. What would you consider the most important factor that separates one solution provider from the next? BLAKE: “Business partner” may be an overused term, but a solution provider who can be a true partner becomes so much more than a provider of things. Too often the fact that one party is selling to another creates an adversarial situation where each side is focusing on their own win. Trust never enters into the equation. In a partnership where each party is actively engaged in creating mutual success, that game-playing can be avoided, and the teams can concentrate on achieving the best solution. Partnering with your customer means ongoing collaboration. You work together to understand the customer’s short- and long-term goals. You also identify challenges that they need to overcome, such as budget, IT resources, future program roll-outs, and so forth. Sitting on the same side of the table and understanding these things allows you to provide long-term value to the retailer. 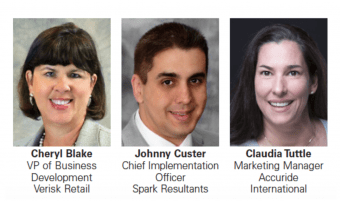 CUSTER: I have had the pleasure and good fortune of working with hundreds of retail solution providers in my career, both as a vendor and a retail practitioner. Just about all have been made up of great people making an honest effort to add value to our industry. There are, however, a few that stand out to me because of one particular trait or ability—one I try to emulate in my dealings with my own company—the ability to say “no” when it’s appropriate. We all want to make the current or prospective client happy. We want to project our company and wares in the best light possible. So saying “no” during a sales call or follow up meeting may not feel like a good idea. But there’s nothing wrong with saying no. This allows for realistic expectations to be created, along with reducing the opportunities for disappointing the client down the road. It’s almost cliché at this point, but it really is better to under-promise and over-deliver, especially in a “small” community like retail where everyone knows everyone and reviews on your solution are just a click or a phone call away. TUTTLE: I think assurance is the most important factor in any loss prevention solution. A provider must do more than deliver a product. A provider must deliver peace of mind to a client. That client must have confidence that his or her business is secure without negatively affecting customers or staff. What would you consider to be the greatest value that a solution provider can bring to their loss prevention customers? CUSTER: This is a great question, and the answer is really quite simple. A solution provider should be able to provide their client with the ability to measurably impact the bottom line of their company. Loss prevention has a singular purpose-prevent losses to the P&L. For decades we have measured LP impact through the number of cases produced, accidents avoided, or “shrinkage” goals met (or missed), but rarely are LP teams able to quantify the direct impact of their everyday interactions and coaching sessions, and their ability to influence the bottom line of each location served. Regardless of what type of solution provider we are discussing, how are you (the solution provider) going to help me (the LP customer) directly influence the top and/or bottom line of my P&L? With my company, this is done through regular reporting and continuously analyzed feedback. But it doesn’t even have to be that complex. More and more, the LP customer just needs the ability to quantify and demonstrate how they helped to put a specific dollar amount, basis point, or other measurable back to the P&L. TUTTLE: The greatest value a provider can offer is to deliver security without compromise to design, operational efficiency, and customer satisfaction. Loss prevention shouldn’t inhibit white-glove service. That’s a major draw for our company and the products we provide. We offer a solution that speeds up authorized access while securing the products we protect, accomplishing all this without altering the design of the fixtures or the products being secured. Put another way, our solutions should protect the merchandise, save time, and reduce hassle that can impact the customer experience. BLAKE: It’s hard for anyone to keep up-to-date with every aspect of our rapidly changing environment. Solution providers bring a wealth of information and as such can be a trusted source of information and advice. As experts in their specific field, they can help the retailer understand new technology and processes. Since many solution providers have added former loss prevention practitioners to their teams, their real-world experience coupled with their product knowledge can offer fresh perspectives to the retailer. I take great pride in the fact that our team is repeatedly approached by retailers for our opinion or insight on projects they’re working on, even where there’s no direct relationship to our products and services. What do you feel is the most common mistake that solution providers make when dealing with their customers? TUTTLE: Too often providers make the critical mistake of not listening to their customers. Every solution provider owes it to their customers to pay attention to his or her needs and respond accordingly, working together to design and implement the best and most effective solutions in ways that are meaningful and productive. This adds real value to both the customer and the solution provider and defines the meaning of true partnership. BLAKE: Without a doubt, it’s failing to listen—both to what the customer is actually saying and to how they’re saying it. When you walk into a meeting, positive that you already know what the retailer needs, you often fail to hear anything that is counter to your beliefs. When you have your own agenda that you’re determined to get through, you blind yourself to signs that the customer has tuned you out. In both cases, the customer feels that they’re being talked at, not collaborated with. There’s no partnership. You’ve lost the opportunity to understand what the customer needs from you. Failing to listen to complaints can be even worse. It can be simple to fix an issue and even feel like you’re the hero. But if you don’t listen and try to understand the underlying cause, the relationship is at jeopardy. CUSTER: I think that fear of challenging the status quo or traditional loss prevention values has somewhat impeded our industry’s evolution for years. I have interacted with many solution providers that would rather downgrade or limit the potential of their offerings in order to appease customers that may sometimes seem to be very set in their ways. As this is being read, every solution provider sales team is probably yelling at me: “That’s called making a sale. You give the customer what they want!” And of course, this is correct, in theory. But I feel it’s also contingent upon solution providers to provide some thought leadership on where a customer might make some adjustments and not be afraid to share that with our LP partners-when appropriate. After all, we typically have access to the latest, greatest technological gadgets, and we arguably have more interaction with other retailers, LP teams, and vendors, to learn and share how others are evolving and adapting. So why not offer new insight or politely challenge aging methodologies? What qualities do you feel are the most important to look for in an individual when looking to build your sales team? BLAKE: Establishing partnerships with our customers has always been the primary focus of our business model. In fact, one of our corporate operating priorities for 2018 is customer intimacy-getting close to our customers through dialogue and interaction, listening to what they have to say, and learning how we can improve. I look for individuals who can directly contribute to this dynamic. We look for team members who can build relationships, not solely focus on the transactional side of sales. Experience working in or with retail is critical but not limited to just the loss prevention vertical since our loss prevention customers interact with all aspects of the business. It’s important that our sales team is adding value, so the individual needs the ability to look at the big picture and provide industry insight. CUSTER: “Pleasant persistence” is always an excellent quality in a salesperson. That is the ability to stay on a lead without being overly annoying or coming off needy. But this is an obvious choice. I prefer to look for either real field LP or operations experience or, at the very least, a fundamental understanding of what it’s like to work in the trenches of retail. This allows the salesperson to customize their message in order to demonstrate the practical application of our offerings to the potential client while staying empathetic to any roadblocks or pitfalls that that may be present. TUTTLE: I see three qualities as essential. A sales team must be informative, relatable, and approachable. Those three qualities are an unbeatable combination.